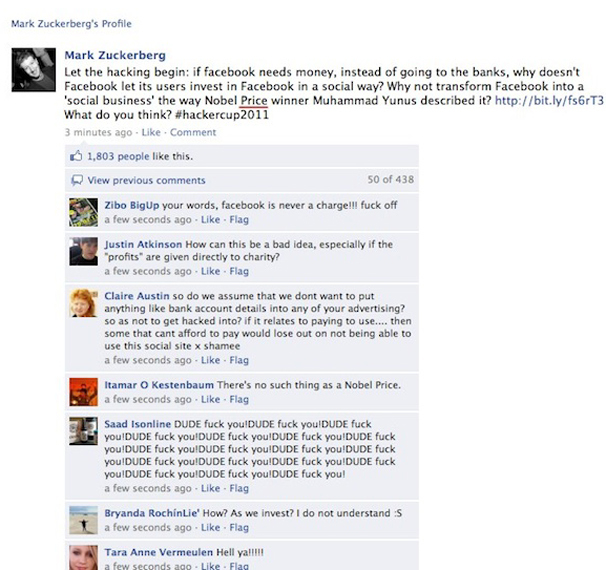 Facebook Founder, Mark Zuckerberg's Facebook Fan Page Hacked ! It turns out even if you own the Internet, you're still susceptible to malicious hackers. Facebook CEO Mark Zuckerberg had to change Web addresses for his Facebook fan page late Tuesday night after a hacker appeared to gain access to the page and had the ability to write status messages on behalf of Facebook's chief. "Let the hacking begin: If facebook [sic] needs money, instead of going to the banks, why doesn't Facebook let its users invest in Facebook in a social way? Why not transform Facebook into a ‘social business' the way Nobel Price [sic] winner Muhammad Yunus described it? http://bit.ly/fs6rT3 What do you think? #hackercup2011,"
The bit.ly link in the message points to this Wikipedia page about "social business," a concept developed primarily by Yunus, a Bangladeshi economist. A social business is a company that exists to achieve specific social objectives such as to overcome poverty or increase access to technology. Founders and investors in social businesses do not take profits from the company, but are able to recoup their original investment money. If the recent status update really was from Zuckerberg, his plans would come as a shock to investors who collectively paid $1.5 billion this month for a piece of the world's largest social network. Facebook users, however, appear to be behind the idea of turning the company into a social business. In the short time the purportedly phony Zuckerberg message was live it received more than 1,800 likes and nearly 450 comments. Although some of the comments poked fun at Zuckerberg or the hacker's misspelling of Nobel Prize. Hacker Cup 2011, the hashtag found at the end of the message, is the first annual worldwide programming competition hosted by Facebook. It's not clear how the page was hacked or who did it, but Facebook appears to be taking the purported hack seriously since Zuckerberg's official fan page has changed URLs. The original fan page was atFacebook.com/markzuckerberg as recently as Tuesday at 7:30 p.m. Pacific, according to Google's cache. But the official Zuckerberg page, along with nearly 3 million likes, is now atFacebook.com/pages/Mark-Zuckerberg/68310606562. We've reached out to Facebook for comment, and will update this post if we hear back. It will be interesting to hear what Facebook has to say, but here's the bigger question: If you had hacked Zuckerberg's fan page what would your status update have been? Let us know in the comments.